The trip was not what I expected. There was a lot of time spent in the van driving all over Minnesota looking for birds along the road rather than getting out into the environment. Days spent glued to a hard bench seat waiting for people to load and unload, peering through fogged up windows, passing time. The weather was better than expected in some ways - the temperature was above zero - but a bummer in other respects - gloomy, overcast, snowy - the entire trip. Here is a typical view from the van. The gray conditions made photography very difficult. Its a good thing that our main objective looks good in gray. 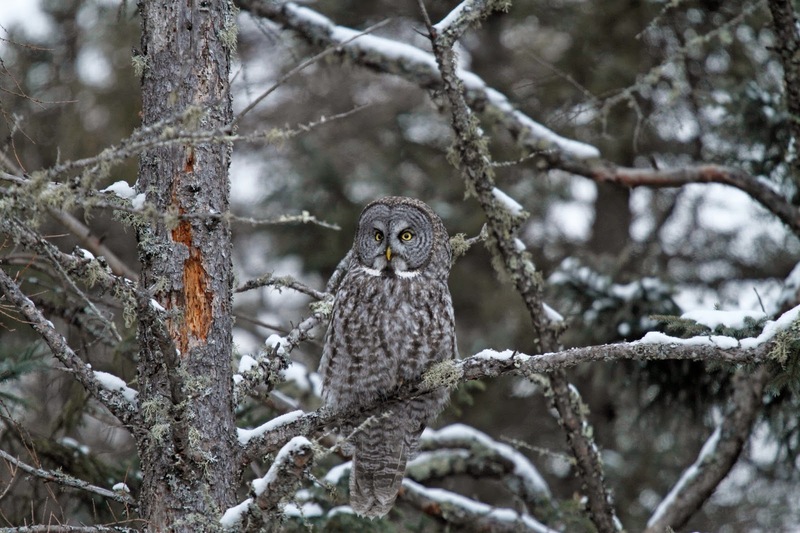 The group was getting very anxious about seeing the Great Gray Owl. We finally got to see this majestic owl on our last afternoon out. There he was posing for the photographers along the road. He sat there for a long time. We pulled up and got to spend about 5 minutes gawking and snapping photos when a guy pulled his SUV in front of the photographers which made the owl fly away. AARRRRGGGGHHHHH! Exuberance quickly turned to exasperation. I almost had a stroke trying to keep my temper under control. Most of the group thinks that I didn't but trust me, the guy wasn't physically harmed, so believe me it was under control. Anyway, I did manage to get a few photos. 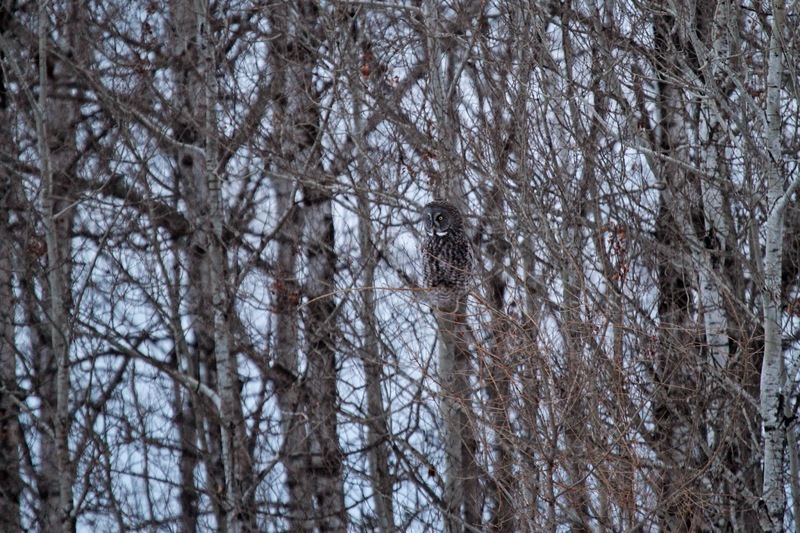 Not my dream shots due to the low light conditions and my ineptitude with camera settings but at least you can see a big owl in the tree. Here is a cropped version. 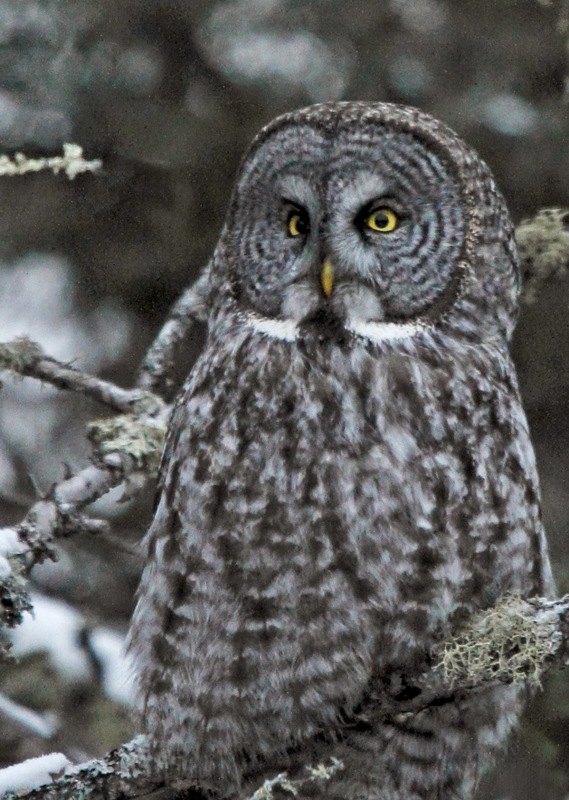 You can see the huge facial disks and the yellow eyes and the white bow tie that make this owl special. When the owl flew away, our leader ushered us into that damned van again to go see if we could find another owl on yet another country road. We did indeed. This one was back a ways in the woods behind a cabin. The cabin owners were not present but there were a few people in the driveway (far beyond the "No Trespassing" sign). They had a bucket which until very recently has mice inside. It became apparent that the reason that the owls were out and about is because people were throwing mice at them. Oh brother. The experience was becoming even more tarnished. Nobody said anything to the people with the mouse bucket but everyone was disappointed. Here is a photo of the owl waiting for another mouse to appear out of the magic bucket. Once again, we loaded up into the van and went back to see if the original owl returned. It had. It was even darker by the time we returned. I tried a few more photos but it was futile. I gave up and just watched hi. When he looks at you, it is like he is looking directly into your sole. The brief moments that we got to spend with him were special despite the humans that tried to ruin it. HA. I'll bring spinach lasagna on Sunday and tell you all about it.